On November 18th, our officers presented the Dean with a check for the restoration of the Cathedral's Library. To learn more, click here. On March 19th, our President & Treasurer presented a check to the Dean for funding of the repair of the bronze doors! To learn more, click here. We are a national fellowship of lay women and men who come together in support of the Cathedral, both to increase its influence in the world and who hope ultimately to see to its completion. It is our annual tradition to remember all those who have gone to their reward in the past year, especially those how have served the Cathedral in various capacities. We began the day with a service in St. Columba's Chapel, followed by the Lecture and Luncheon in Cathedral House. Our lecturer was Dr. Leslie Bussis Tait of the Metropolitan Museum. Leslie has been with the Met, as an Educator for Museum Teaching, since 2004 and is a PhD in the History of Art from Columbia University. She presented a 40-minute discussion of the history of vestments and the general reasons why some items look the way they do and the role they play. The Cathedral has made a proposal to the club for a grant to upgrade some of our vestments, which are particularly important now that we are live streaming mass! This lecture helped us understand the request. We had an opportunity to see the "Heavenly Bodies" exhibition, plus drank in the tranquil sacred solemnity of a medieval monastery. A record number of members, plus our Dean and Vicar, showed up for the 110th Annual Meeting. We enjoyed a great meal and fellowship, followed by our meeting and election of new officers. We also learned the results of our membership survey and participated in some planning for the future. The Board of Governors is grateful to all who participated and will be busy in the next few months following up on all the suggestions and input from the survey, so that our club can continue to thrive in it's mission. Lastly, outgoing President Chris Johnson received a commemorative gift and standing ovation for his service! A large portion of our membership dropped in for an open house for the launch of our membership survey. We enjoyed fellowship, wine, coffee, cheese and sweets, while we learned about the survey, got assistance filling out the survey online (laptops were provided) and discussed the future of our club. Our thanks to organizers Susan Chute, Lisa Chin and Ruth Mueller-Maerki. We even had a raffle for prizes from the Cathedral Shop! For those who could not make the event, we will be emailing members a link to the survey online. Then, at our annual meeting in May, we will present the results. On Saturday, October 28th, our club observed its annual All Saints' Memorial Service followed by a fellowship meal in Cathedral House and a lecture by Interim Dean Daniel. We gathered for the Noon service in St. Martin's Chapel, to remember all the saints of God, past, present and future. 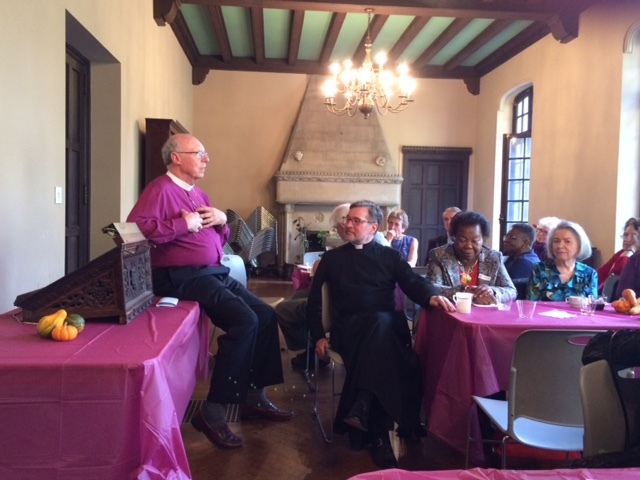 Then we adjourned to Cathedral House for a fellowship lunch followed by a talk, led by Interim Dean Daniel. Approx 50 people enjoyed a delightful reception and fellowship lunch, followed by our Annual Meeting with Election of new Governors. Our meeting was followed by a special guest speaker, The Rt. Rev. Andrew St. John. 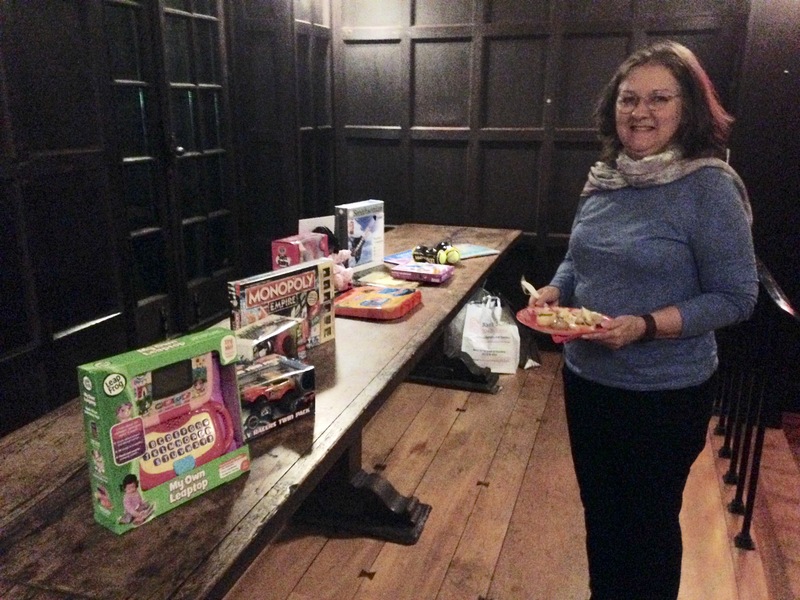 Each year in early December, our club donates toys which benefit the children of clients of Cathedral Community Cares, the Cathedral's social justice arm. And we do it in a fun way . . . with an evening of fellowship, holiday cheer and the singing of Christmas Carols! This year's event was enjoyed by all. Please remember, toys can still be dropped off at CCC right up until Christmas Day. followed by dinner and lecture. We began with mass held in St Martin's Chapel, with our new Canon for Liturgy & the Arts, The Rev. Dr. Patrick Malloy presiding. This was followed by a fellowship dinner and a superb lecture by Jon M. Sweeney about the life and contributions of Phyllis Tickle. Members and their guests met for a photo op on the western staircase of the Cathedral at 4pm to wonder at the newly cleaned granite and to test out the new steps! Then we adjourned to the Rose Garden for a wine & cheese cocktail reception and fellowship. See Photos from the event. This is the largest grant the Laymen's Club has given the Cathedral in many years. Let us rejoice in such an important contribution we have made to the many pilgrims who approach this House of Prayer. More than 50 people showed up for this great gathering of members as we enjoyed a delightful reception and fellowship lunch, followed by our 108th Annual Meeting with Election of new Governors. We even had 5 new members in attendance. The meeting was followed by our Special guest speaker The Rev. Canon Victoria Sirota. On April 2nd, we organized a special tour, which was led by John MacKay, the Cathedral's Capital Projects Manager. Around 30 club members and guests took a close look at the construction projects the Laymen's Club is currently funding. We also had an opportunity to view and ask questions about projects the Club has funded in the past. Each year, our club donates toys which benefit the children of clients of Cathedral Community Cares, the Cathedral's social justice arm. And we did it in a fun way! We enjoyed an evening of fellowship, holiday cheer and the singing of Christmas Carols. 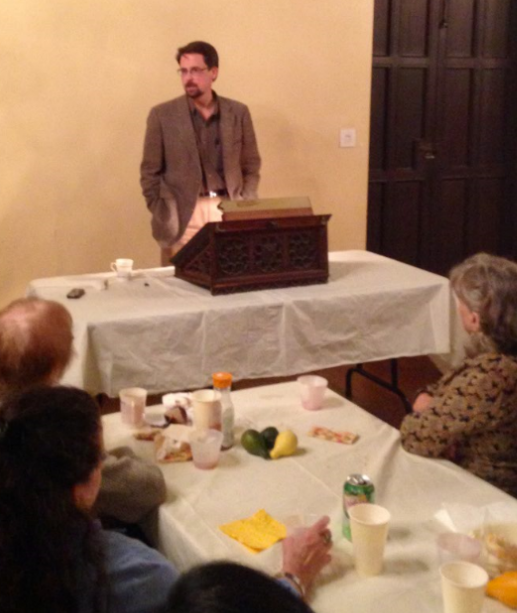 On November 4th, we held our annual All Saints Day Observance, followed by dinner and lecture. This is the time when we remember all the saints of God, but particularly those club members and anyone involved in the Cathedral who went on to their reward in the past year. The Rev. Thomas Pike served as celebrant at the mass held in St Martin's Chapel, followed by dinner and the lecture by Rev. Pike in Cathedral House. On October 25th, The Laymen's Club invited The Canterbury Clubs of Columbia and NYU to join us for an Evensong Fellowship , followed by a fellowship dinner at V&T's Restaurant. Members joined us to welcome these university students in sharing our worship and meals together. Students were given a special vertical tour prior to the service. Two students also got to read the lessons. It was a wonderful opportunity to bring young people to our Cathedral. Cathedral House was filled to the brim as our members enjoyed a delightful reception and lunch, followed by our 107th Annual Meeting with Election of new Governors. We then had the honor of hearing Sally Benner as our guest speaker. She is our Cathedral's VP of Development and Strategy. The Untold Story of Eleanor Roosevelt and Alice Roosevelt Longworth"
Cowritten by Timothy Dwyer, one of our club's officers. A discussion panel was led by FDR III with reception provided by The Laymen's Club. In addition to our members, another 150 guests were present. Twenty of our members and guests enjoyed a guided tour of early Florentine Renaissance sculptures at the Museum of Biblical Art (MOBIA) which is at 61st and Broadway. These works, by Donatello, Brunelleschi, Nanni di Banco, Luca della Robbia and others, were made in the first decades of the fifteenth century for Florence Cathedral ("Il Duomo"), which was then in the last phase of its construction. We got a very good idea of Cathedral building (it took more than 600 years to create the finished Duomo we see today) and conservation of art works - especially marble statuary, so pertinent to managing our own beloved Cathedral in our time. Afterwards, we adjourned to nearby Rosa Mexicano for some much deserved fellowship to discuss what we learned. In keeping with the mission of The Laymen's Club which includes supporting the Cathedral and its programs, each year's St. Nicholas Observance donates toys which benefit the children of clients of Cathedral Community Cares (CCC), the Cathedral's social justice arm. This year, we collected more than $1000 worth of toys! 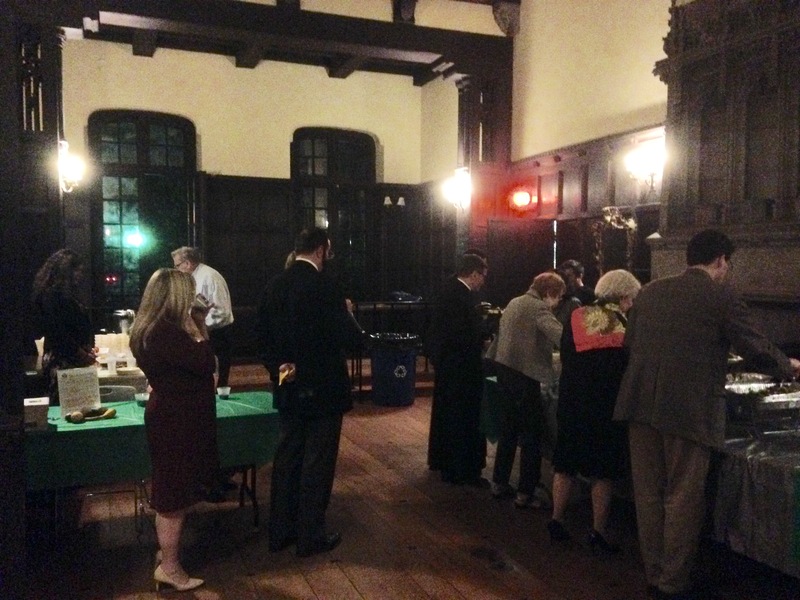 In addition, we enjoyed an evening of fellowship and some holiday cheer with a Wine and Hors d'oeuvres reception in Cathedral House followed by the singing of Christmas Carols. The Reverend Canon Patti Welch presided over a beautiful mass where we remember all the Saints of God; past, present and future. Especially in our prayers are those members of The Laymen's Club who had died in the past year and those other good and faithful souls who have served our Cathedral, in particular Anne Harrison, Ray Guyette and Dorothy Jackson. After the service, we got a tour of the Madeleine L'Engle Library where Charlotte Jones Voiklis, Madeleine L'Engle's granddaughter, gave us a talk about Madeleine's illustrious career and important ties to our Cathedral. To honor the architect who had the most impact on our Cathedral, we celebrated Cram's work with a lecture by Jay Pridmore who is a reknowned journalist, author and coauthor of many books about architecture. Our special guest included Ethan Anthony, current President of Cram & Ferguson. The event began with a tour in the Cathedral itself and also included two other Cram buildings on the Close; Cathedral House and Synod House. 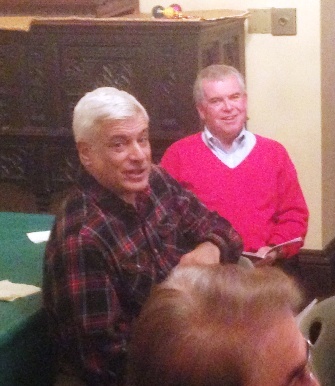 Tours were given by senior Cathedral Guides John Simko and Tom Fedorek. Then, we all gathered in Cathedral House for a buffet lunch followed by Jay's presentation. Prevailing feedback says this was one of our best events in a long time. On June 28, club members and their guests attended the Guastavino Tile 'triple play' Tour. Led by Senior Guide John Simko, we went on a three part tour of this legendary tile in our city. We began at MCNY (photo below) for an overview of their latest exhibit "Palaces for the People: Guastavino and the Art of Structural Tile", which is a major exhibition exploring the innovations of the Guastavino Fireproof Construction Company. Then, we preceeded to our Cathedral for a look at the great dome, and a climb down the famous stairs which goes down into our crypt (see photo left). While there, we enjoyed a boxed lunch within the Cathedral itself. Afterwards, we visit Holy Trinity Church at West 82nd Street, which resembles a miniature Hagia Sophia in the interior and is dominated by Guastavino tile including a beautiful 66-foot Guastavino dome very different than our own. On May 18, Senior Guide John Simko's took us on his new tour "It's all about the donors" followed by a garden tour. John highlighted some of the key supporters of our Cathedral over the years, followed by a Garden Tour, given by the Cathedral Gardens Conservancy. We had a chance to learn about the donors who contributed to the fabric of our great cathedral, and met some of the dedicated gardeners of the cathedral grounds. Our thanks to Maureen Nipar and Sandra Myers Smith of the Cathedral Gardens Conservancy. Afterwards, we met for some fellowship with light refreshments in Cathedral House. As is our tradition, our members gathered for a Corporate Communion during the 11 o'clock service, followed by a lunch in Cathedral House. Afterwards, we held our meeting, reviewed the activities of the club in the past year, heard reports on the financial health of the club and its contributions to the Cathedral and had a special presentation by Keith Hinkson, the Cathedral's Director of Security. About two dozen of our members joined us on a early spring saturday morning for a walk-through of the Northfield Development site, given by Stephen Facey, Cathedral Advisor for Preservation and Development. Given the importance this has to our Cathedral's finances and an overall impact on our facilities, the Board of Governors organized this informative event especially for our members to make them better informed about our development plans. Our thanks to Steve for a fabulous presentation. Afterwards, we enjoyed a light lunch and fellowship in Cathedral House. Our thanks to our guides, Gloria Frey and Gene Carlucci, who enlightened us! We had almost 40 people so we had to split into two groups. Afterwards, we went over to Le Monde for some coffee and pastries to discuss the exhibition. The Laymen's Club participated in the Absalom Jones celebration on Feb 8th. We processed with our banner and also had a table at the reception afterwards. This Diocesan wide event annually celebrates the life and ministry of Absalom Jones, former slave and the first African-American ordained as a priest in the Episcopal Church. The service is open and welcoming to all, in commemoration of Jones's life and perseverance against exclusion, intolerance and oppression. On January 30th, members of the Laymen's Club and their friends and family were invited to an informal sneak preview of the Phoenix project, an art installation currently being set up at the Cathedral. The internally illuminated 12-ton birds are suspended mid-air inside the Cathedral Nave dwarfing visitors; the male Phoenix Feng measures 90 feet long, while the female Huang reaches 100 feet in length. Some of our members went out afterwards for a fellowship supper to discuss the exhibition.